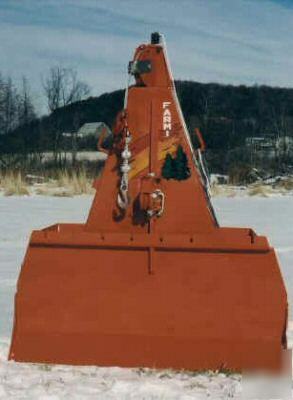 Brand New Farmi JL601 Logging, Skidding Winch with Dozer Blade. Though all Farmi Winches are Heavy Duty, The JL601 is an EXTREME DUTY LOGGING WINCH!!! * Recommended Tractor size is 60HP to 150HP. * Plus, the Model 601 has an adjustable Lower Snatchblock and 2 Tool Pockets. * Pulling Capacity is 13200lb's. * Drum Capacity is 430' of 3/8" Cable. * Winching Speed is 2-1/2' to 5' per second!